I really love GSM wines, those blends of grenache, syrah and mourvedre that originated in France’s Rhone Valley and have spread around the world. I especially love the wineries that change the blend every year to accommodate the vagaries of the harvest. Donelan Family Wines is one of those. Donelan specializes in Rhone and Burgundy style wines, and owner Joe Donelan believes in finding the right grapes from the right places. The 2014 vintage of Cuvee Moriah, named for his daughter, focuses heavily on the grenache, which makes up 84 percent of the wine. Mourvedre is the other 16 percent, with no syrah. In 2012 it was 64 percent grenache, 24 percent mourvèdre and 12 percent syrah. I didn’t miss the syrah one bit, because the wine is so seductive. The grenache’s delicate fruit flavors of pomegranate and rhubarb are balanced by the lush mouthfeel and savory notes of the mourvedre. It is a beautiful wine with a long finish. The grenache is grown in the Dry Stack Vineyard in the Bennett Valley Bench, with its rocky volcanic soil. The mourvedre comes from the Kopf Vineyard in Kenwood, and it features warm volcanic soil. Both the grenache and mourvedre are fermented with roughly 50 percent whole-cluster fruit. Due to the large berries and thick stems, small amounts of carbonic maceration occur prior to full maceration, helping to lift the aromatics of the final wine by infusing additional hints of red currants and fresh violets. The grapes were fermented in stainless steel, followed by 18-20 months in mostly used large casks. As I do with most of my red wines, I decanted the Moriah about 30 minutes before we started drinking. I liked the wine as I was cooking, but it really came alive when we had it with dinner. This is a wine that loves food and should pair well with a wide range of dishes. It should age well for another 5-10 years. The back label on the bottle says Cuvee Moriah is inspired by the great wines of Chateauneuf-du-Pape. It is an apt comparison; this wine is a good match for the great wines of Southern France. Winery: Joe Donelan was a successful executive at paper broker A.T. Clayton in the 1980s. He loved people, travel, wine and food, so naturally he enjoyed entertaining his clients. Becoming friends with the sommelier at his favorite restaurant in Nantucket, Joe’s passion for wine grew. He visited California and France and came to appreciate wines from all over the world, but especially those from Burgundy and the Rhone Valley. When an opportunity presented itself he founded Pax Wine Cellars with Pax Mahle in 2000. They focused on single-vineyard Syrahs from Sonoma County and business boomed. In 2009 Joe formed his own company, Donelan Family Wines, along with his sons Tripp and Cushing who share his passion for wine. 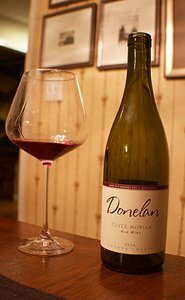 The Donelan family began making waves with their first vintage in 2009, becoming known for high quality Rhone and Burgundy varietals. They give each wine special attention, starting with small-parcel vineyards in Sonoma County. They concentrate on small yields, gentle handling, attentive sorting and meticulous blending to capture the distinctive characteristics in each bottle. They started by buying fruit from select vineyards. Then in 2015 they bought their first estate vineyard, the Obsidian Vineyard in Knights Valley. The family also has long-term lease agreements for key vineyards in Sonoma County. Joe Donelan is a big believer in the importance of where the grapes are grown. “It is like real-estate: if you have a great location, then you should be in good shape. We believe that the best wines are not made, they are discovered. Site really trumps all variables,” says Donelan. in select high-end wine retailers and restaurants. Their wines include: Nancie Chardonnay ($48), Venus Roussanne/Viognier ($48), Cuvée Christine Syrah ($48), Cuvée Moriah GSM ($50), Two Brothers Pinot Noir ($55) and Walker Vine Hill Vineyard Syrah ($75), The Rosé ($25), Kobler Family Vineyard Syrah ($60), Genevieve’s Block Chardonnay ($70), Kobler Family Vineyard Viognier ($78), Tripp’s Block Pinot Noir ($78), Cushing’s Block Pinot Noir ($78), Cuvée Keltie Syrah ($90), Obsidian Vineyard Syrah ($105) and Richards Family Vineyard Syrah ($150). They are available by visiting www.donelanwines.com. Goes with: We had this beautiful wine on another busy weeknight as we were making our holiday preparations. So, it was a night where the wine made the meal. I love to cook, but I also have several easy meal fallbacks when I don’t have time to concoct a full-blown dinner, On this night it was Sloppy Joes. All you need is a pound of ground beef, a small can of tomato paste and McCormick’s Sloppy Joe mix. After you brown the ground beef and drain the fat, mix in the spices from the package, a little water and the tomato paste. The dinner is ready is less than 30 minutes, after the water boils down and the mixture thickens. Serve it on hamburger buns. When I want to get fancy I toast the buns in the oven. We added potato chips and cut up vegetables (If we were at a fancy party, they would be called crudités.) to make a more or less well-rounded meal. Sloppy Joes first came into my life in college, when the cook at my fraternity house would make them every week. We never had leftovers. My dad loved them because his name was Joe. He would laugh every time I said I was making Sloppy Joes. 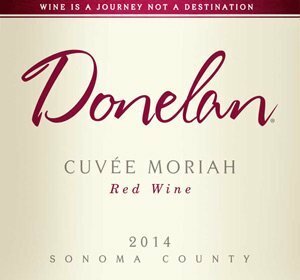 Donelan Cuvee Moriah is an elegant wine that would pair well with many fine dinners, such as beef Burgundy, goulash, duck, lamb chops and lamb shanks, and all kinds of slow-cooked meats such as pork or beef. The winery says this would be a magical pairing with Moroccan cuisine such as tajine.